Since November 2016, FAW-VW, Volkswagen’s joint venture in Changchun, China, has never been clear of labor disputes around the issues of temporary labor.2 Two years ago, a group of agency workers led by the worker Fu Tianbo started a public protest demanding equal pay and regular employment. FAW-VW responded to the workers’ struggle by offering regular work contracts to about 3,000 agency workers in Changchun in 2017 under the condition that the workers give up their claims on the payment of the earlier wage difference and forget about all other payment disputes.3 Since then, the agency workers’ struggle hasn’t gotten much public attention and the arrested leader Fu Tianbo has disappeared. The wages of these former agency workers are at the lowest level at FAW-VW. The basic wage is the same as the local minimal wage around 1,760 rmb. The low basic wage makes the other parts of their income also lower, including the overtime wage and bonuses. It is claimed that the monthly wage difference with other workers in the same position is around 1,000-2,000 rmb. Besides, all workers are facing falling incomes because of the worsening market prospect of FAW-VW. Workers do not have as much overtime anymore and instead many breaks. Workers claimed that the company increased the workload and unit output per hour and increasingly used student interns instead of agency or outsource workers as a temporary labor force. The newly hired workers are also worried that the company would not pay the annual bonus that normally makes up almost half of the income of production workers in FAW-VW. While most of the former agency workers are waiting for the company’s next move, only a few workers have tried to place their complaint with ACFTU branch and governmental bodies. Their appeals and complaints got no respond, except for warnings and reprisals from the managers. The agency workers’ protest opened the door for more protests by other groups of temporary workers at FAW-VW, both on the shop-floor and at the local labor mediating organs. In June 2017, around 500 outsourced workers launched a legal protest demanding the same “equal pay for equal work” but got little positive response. That protest of outsourced workers overlapped for some time with that of agency workers. While the later attracted international attention, the outsourced workers’ protest was largely ignored. More recently, the outsourced workers from two different firms got together to defend their legal rights. This revealed more problems of the extended use of temporary labor in FAW-VW’s plants in China and the divisive employment strategies the employer uses to split workers’ protest. FAW-VW has worked mainly with two labor agencies: Hongxin Youye Human Resource Company (HXYY) and FAW-VW Labor Service Company (LSC). HXYY was part of the protest of agency workers in 2016 and 2017 when around 3,000 agency workers who had worked in FAW-VW for more than 10 years became FAW-VW’s regular workers after the protest in 2017. However, FAW-VW did not sign the contract with all the agency workers in HXYY. Around 2,000 of them who started to work in FAW-VW between 2009 and 2010 were not asked to sign the ‘turning regular’ contract but a different contract that dispatched them to a subcontractor of FAW-VW when their last two-year dispatch contract expired at the end of 2017. FAW-VW and HXYY did this to avoid having to give them ten-year-employment after the next contract expires. The workers who refused to sign the outsourcing contract were dismissed. This turned the former workers into ‘outsourced workers’ and made their status even more precarious. The management told the workers that they were not ‘turned regular’ as the 3,000 agency workers because they did not reach the 10-year seniority, a condition set by FAW-VW before offering regular contracts to agency workers. LSC used the same tricks. LSC workers have worked at FAW-VW for 15 years (since 2003). Initially, their company was owned by the trade union of FAW-VW.4 Right before their total contract period reached ten years, their contracts were quietly converted into outsourcing contracts in 2013.5 The workers signed a dispatch labor contract with Caihong Human Resource Service and Consulting Company, were then dispatched to LSC which became a ‘subcontractor’ and sent the workers to FAW-VW. This was to avoid having to sign open-ended contract with LSC workers according to the labor law. The latest contract was signed for the period between January 1, 2017, and December 31, 2018, this time with Changchun Bozhong Auto Parts Limited Company. Bozhong is exactly the same as LSC, just with a different name.6 According to workers, this change was a result of the agency workers’ protests in 2016 and 2017. FAW-VW intensified its attempts to whitewash the illegal use of temporary labor as it feared that the workers’ protests would get out of control. Workers said that Bozhong still has around 3,000 outsourced employees working in FAW-VW and its engine company in Changchun. Despite the changes of contracts and company names the workers’ labor content and position has not been changed. They have been integrated into work groups at stations on the production lines, and regular workers, agency workers, and student interns have been doing the same kinds of work. They have been supervised by FAW-VW’s managers and have been working under the same regulations as the regular operators. The subcontractor Bozhong has had no own management structure and production system. The workers took this as evidence of illegal “fake subcontracting” by FAW-VW. For many years, outsourced workers have worked together with formal workers of FAW-VW. Now, FAW-VW transfers its formal employees from mixed working groups elsewhere, leaving only outsourced workers on the “outsourced part” of the production line. The outsourced workers claim that their unpaid wages accounts for 1.3 million rmb, calculated from the wage difference between outsourced and directly employed since the implementation of the Labor Contract Law in 2008. Yet, their struggle has been extremely difficult. As the outsourced workers have a more insecure and vulnerable status, most have to accept whatever the company offers them. Their marketplace bargaining power diminished as FAW-VW has faced overproduction in recent years. FAW-VW and Bozhong have both dismissed many workers. The remaining are worried that the company would fire them if they express any grievance. So only 207 workers publicly participated in a protest. They hired lawyers in an attempt to raise their case at the ACFTU, the Labor Bureau, local courts, and other government bodies. They also petitioned the provincial government and the government in Beijing. Their efforts were met with either rejection or indifference. 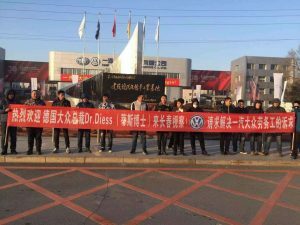 On November 11, the workers demonstrated in front of the factory gate with a banner demanding that Herbert Diess, the CEO of VW who was visiting Changchun for the 30th anniversary of Audi in China, should resolve their dispute. 1 This report is based on interviews with agency and outsourced workers of FAW-VW in October 2018. 2 China’s automotive industry knows three main forms of temporary labor: through temporary work agencies (in China called dispatched labor), as outsourced labor (often a disguised form of work for temporary work agencies, and as student internships. 4 The state encouraged governmental bodies and SOEs to run labor agencies in order to deal with local unemployment, especially in industrial bases where many SOE workers had been laid off. 5 This followed the amendment of China’s Labor Contract Law in 2013 that added more regulations on dispatch employment. 6 Changing labor contracts and employers’ names is a common trick used by employers in China to avoid employment responsibilities. This entry was posted in Texts and tagged auto industry, auto worker, FAW, outsourcing, temporary agency, VW, Xia Nü. Bookmark the permalink.